Doesn't it amaze you that something understood and accepted by the Chinese for thousands of years, has now been proved to work by sceptical westerners and is available on the NHS? 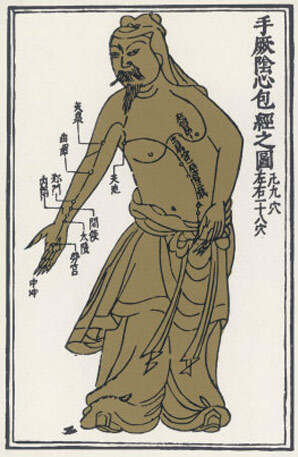 Acupuncture has been utilised in the Far East for over five thousand years. They knew even then that 'chi' (that’s energy to you and me) flows through the body, and if it becomes blocked or out of balance for any reason, health problems ensue. Maintaining a balance within the body was their priority, and their diagnostic 'tools' were simply looking at the tongue and taking your pulses. Yes, pulses plural, we have at least five, each representing one of the elements - wood, fire, earth, metal and water. And the tongue can tell us a lot about a patient, but not verbally. Colour and coating are great giveaways. Treatment was by simple needles, inserted into the appropriate spot in order to allow the chi to flow and the body to balance itself naturally. Regular and frequent acupuncture to balance the body and mind enabled the Chinese to stay healthy, prevention being better than cure. Whereas we wait until things have gone badly wrong and try to fix it afterwards. We need X-rays, scanners, thermometers, blood tests, major invasive surgery, operating theatres, and all the other paraphernalia of western medicine. The exciting thing is, said Dr Fiona Firth in her talk following our AGM on 11th November, that we are now able to prove acupuncture works to the extent that it is available on the NHS. Tests have shown that if a qualified practitioner inserts the right needles into the right acupuncture spots on the right meridians (energy lines), the effect on the brain will show up on an MRI scan. Well, you can’t argue with that, can you? 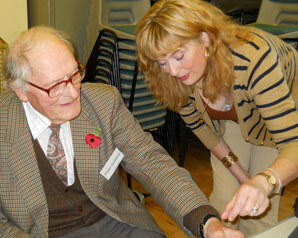 Dr Fiona Firth demonstrates acupuncture on Chairman Peter Golding during her talk. His comment? "Ouch!" Obviously acupuncture is better at treating some things than others. Pain control to the extent that a willing patient can cheerfully have a tooth removed with just a couple of needles in place. Backs. Knees. Asthma. Menopause. Digestive complaints. It is apparently fantastic for gynaecological problems including female infertility, but every acupuncturist dreads being asked to treat tennis elbow! It doesn’t seem to work for tennis elbow, maybe because we exhaust all other avenues first and only turn to acupuncture too late in the day. If you’ve ever resorted to one of those wrist bands to alleviate travel sickness, you have already used pressure acupuncture. The vital thing is to hit the right spot. About two thirds of the population feel the benefit of acupuncture, and a third do not. Interestingly, this mirrors the general response to morphine. Two thirds of us respond well, a third are low morphine responders and do not experience the same level of pain relief. There are 14 meridians throughout the body and some 370 acupuncture spots, so it takes some training and application to learn all that. A trained practitioner will be able to ‘feel’ the right spot to insert his or her needles, and feel a difference in the skin. Equally, she will know the right time to pull the needle out! Too soon and it won’t want to come. As this can vary from 30 seconds to thirty minutes, it is a skilled assessment indeed. Fiona demonstrated this on volunteer Peter Golding. His comment? "Ouch!" As we know, doctors are not allowed to treat animals but qualified vets are also using acupuncture more and more. An animal naturally knows when you are trying to do it good. For those who can’t face 'the needle', there are alternatives in electronic and laser devices which is effectively acupressure and does not hurt at all. Our speaker admitted though that results might not necessarily be quite as good. During a lively question time, members asked if Fiona had tried reflexology and Reiki. Indeed she had, and dowsing too. "It’s all rivers running into the same sea," she said. "Anything that unblocks the flow of energy and balances the body not only works, but today it is seen to work too."